The Chaddesley Corbett Neighbourhood Plan has reached the important Regulation 14 consultation stage. Kirkwells have supported Chaddesley Corbett in their neighbourhood plan preparations by turning the work undertaken by the steering group and theme groups in to effective planning policies. Working closely with Wyre Forest District Council this means that the Chaddesley Corbett Neighbourhood Plan a high quality plan has been produced that is in accordance with national and local planning policy. 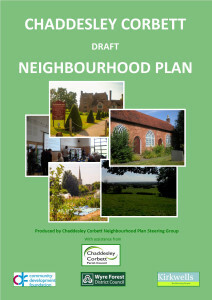 To find out more about the Chaddesley Corbett Neighbourhood Plan click here. If your steering group need help putting their ideas in to the correct “planning language”, language that means they will do what you want when faced with development proposals call Louise on 01282 872570. Or email requesting a copy of our Neighbourhood Planning brochure. Kirkwells are one of the leading chartered town planning consultancies supporting communities in the preparation of neighbourhood plans.